Flexboat’s Miniflex is ideal for a quick jaunt across the lake or an easy sunset cruise. Flexboats are made of durable Hypalon (Orca 828) material, the highest quality recreational grade available. No other inflatable builder in the world offers the strength, quality and performance of a Flexboat. One of the many advantages of this boat is that it can be rolled up and stored when not in use. In addition to its own carrying case, the Miniflex comes complete with 2 paddles, foot pump, air valve adapter, repair kit and owner’s manual. No assembly is required, simply blow up the 2 chambers and you are ready to go. 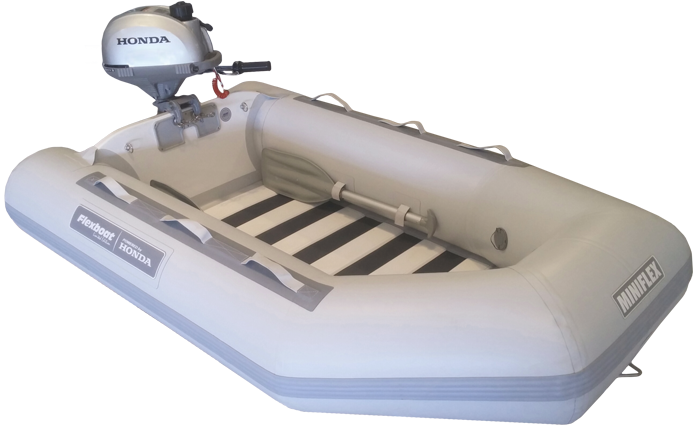 The 2.3 HP Honda Outboard motor works perfectly for this 2 passenger inflatable boat. Motor sold separately.